Earlier this week, I was invited to a Quentin Mackay Press Day for their AW10 collection. Quentin Mackay bags are gorgeous and we've seen them on the likes of Victoria Beckham. AW2010 is the third season for Quentin Mackay, and his Ball & Claw collection has received a lot of attention. It's a beautiful design and so well thought out. He got the idea for it from the carving of the feet of a sewing machine he received from his Grandmother when he was 15. I managed to speak to Quentin Mackay and he was really interesting and knowledgable about the bags. He went through each collection bag by bag, and I learnt a lot about the bags and the brand. The bags aren't mass produced items and each one has a unique code to it.The inside lining is red, and like with all the other bags, each one is individually branded and numbered on the inside, making each one unique. It is evident to see that the bags are madereally well: Quentin Mackay said that he has a passion about quality and hardware, so you can see that no corners were cut when making each bag. You can also the quality of the brass hardware of the Ball and Claw on each bag. 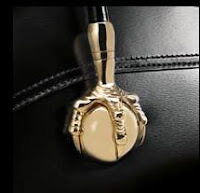 The Ball & Claw is either brass with platinum (silver) or brass with gold plating (gold). Quentin explained the process of making the Ball & Chain and it's a very delicate and intricate process: exactly like how jewellery is made. These bags were all gorgeous. They are large-ish shoulder bags, which is a perfect day bag. It is clear the Quentin really thought about functionality when designing this. Each bag has a key leash on it, and it can also be used as a safety clasp, so that you can attach it to your arm or chair. While talking to Mackay, I also learnt a bit about the designing world. One particular skin, called Porosus Crocodile, is very hard to come by and a very small amount gets allocated to designers. 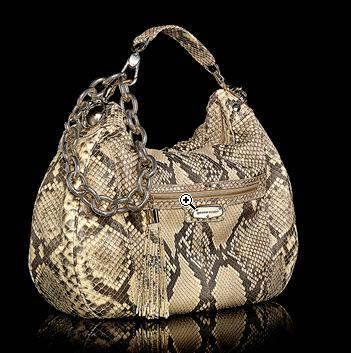 This is a more casual bag, and is quite slouchy, that you can put it on your shoulder. Again, it's clear to see that Quentin thought about functionality. The strap can be extended, so that you have it as a shoulder bag, and it can also be made a lot smaller, so that it's more of a handbag. I felt the Python one in this collection and it felt really good. Both these bag's are more of an evening style. Both have really light chains, making them easier to carry in the evening. Daphne is very soft leather, made from Sugar Wool. The bags also come with a 'B-Tag'. Basically, you take a picture of the tag, on your phone, and it will automatically direct you to the website, giving you more information about the product and the brand. P.S. I have two very interesting events next week as well, so yay! P.P.S: I may be lacking in outfit posts over the coming weeks. from the end of next week, I will officially be out on the campaign trail for a politician in the run up to the Election. That means that I'm going to constantly be in jeans and sneakers. Wow. I am such a bag person... I'll wear cheap shoes any day if I have to choose between expensive bags and expensive footwear. The Showgirl is fantastic - I have to check out the website now... xoxox. Gorgeous bags! I appreciate the amount of care and attention he put into these bags, and I love the idea of the claws. The collection is stunning, no wonder it is so coveted! They are perfection. wow! you have an amazing job. i love those bags especially the animal print one. just gorgeous! Great post! I'm really loving these handbags. They all look so pretty! 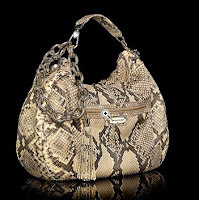 I love the snake skin bag which looks like a ¨hobo bag¨to me. I´m glad to know that he doesn´t mass produce his bags. Fabulous ! And thank you so much for your lovely comment ! I'll be back soon ! love all the details! have fun next week! you are right, they are gorgeous!!!! Loved this post! So have a look at Traid's website below, they have few shops in London. These bags are beautiful and I love the claw! I wish I had one. which events is it you're going to - the jasper garvida one on monday? & mystery fashion one on tues? if so I'll see you there!!! Ii is too stylish and all colour are good.